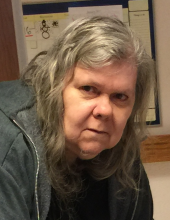 Carolyn J. Padgett, 63, of Crivitz, passed away unexpectedly at home Saturday, February 9, 2019. She was born to the late Earl and Virginia (Lagman) Padgett March 7, 1955 in Manistique, MI. Carolyn enjoyed her cats, especially Frisky. Surviving are three brothers, Randy Padgett, Terry (Peggy) Padgett, Tim (Tina) Padgett and nieces and nephews. Besides her parents she was preceded in death by her brother Daniel. Private services will be held at a later date. Rhodes-Charapata Funeral Home, Crivitz is assisting the family. To send flowers or a remembrance gift to the family of Carolyn J. Padgett, please visit our Tribute Store. "Email Address" would like to share the life celebration of Carolyn J. Padgett. Click on the "link" to go to share a favorite memory or leave a condolence message for the family.